The move-in is complete and business has opened at the new studio at 160 North Fairview Ave, Suite 2! I sincerely hope to see you there soon, if I haven’t already. With the opening of the new studio comes an opportunity to relaunch. 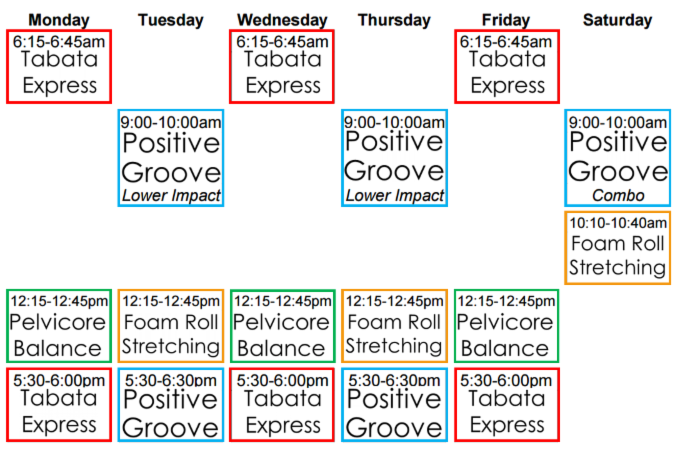 Zumba classes are changing to my own format, Positive Groove. The name of the class is the biggest change, what you experience in class won’t be any different. It’s the same awesome mix of music, and the same dependable cueing you have all come to know and love. Lower Impact classes weekday mornings, higher intensity weekday evenings, a mix of both on Saturdays. I have added a Foam Roll Stretching class as my last class of the week to help you recover from your work week and head into the weekend feeling terrific. If you have a suggestion for a class format, a day or time you’d like to see a class added, or a fantastic instructor you’d like to see on my schedule, please let me know! All classes are now OPEN, meaning you can join at ANY TIME! You don’t have to wait for a new session to begin, and you can use your class pass you currently have on your account to pay for ANY class on the schedule! With 17 classes weekly, and 4 formats, this gives you so much flexibility to try something new, which is totally awesome for your body, by the way! Due to the more intimate size of the studio, I need to initiate class size limits and use a reservation system to hold your space. Use my website www.FitnessRachel.com – go to “services” then “schedule”, or go to “store” and “shop now” to use the full MINDBODY site. It’s easiest via the MINDBODY app on your smart phone. You get 5 reward points every time you pre-register for a class! Should your plans change, simply cancel your reservation more than 2 hours before class begins to notify those on the waitlist, and to ensure your account doesn’t get charged for a class. Immediate family members may share a class pass (spouses/partners or parents and their children), and you are welcome to occasionally “treat” your friends using your pass. FIRST CLASS for new clients is $5, but if you tell anyone you want to bring to sign up for emails on my website, they can get they’re first class for FREE. Since your current class passes can now be used for ANY class on the schedule, PLEASE come try something new! It’s SO good for your body to mix things up!